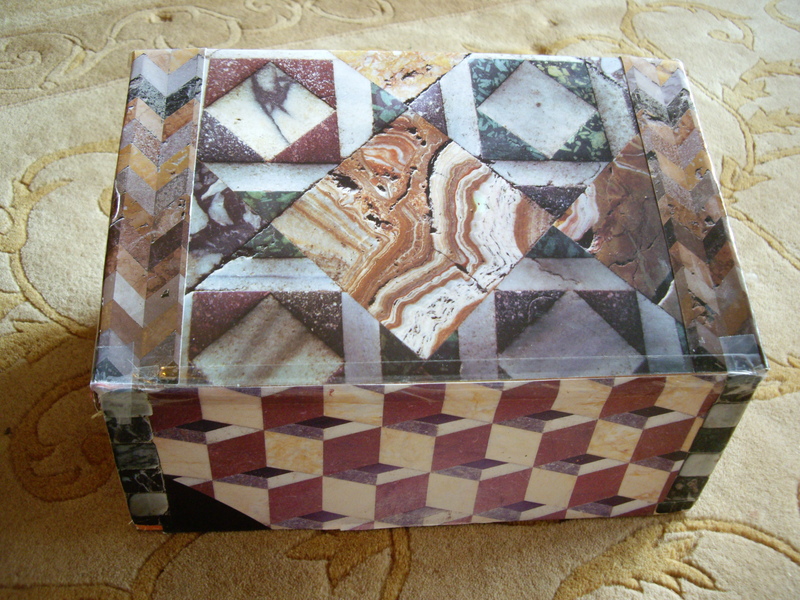 I made the Feely Box (as it is affectionately known) to look like it is made of stone, rather than cardboard – it started life as a shoebox – so that the first thing you have to do is touch it to see if it is real stone. It is covered with paper photographs from an old book of of marble tiles, which I cut up; it was all in Italian, which I can’t read, and it seemed a waste not to use the beautiful photos. I could have used Spongebob or Peppa Pig wrapping paper instead, but I didn’t because I am trying to veer away from mass-market toys, and wanted to convey to the users of this box that small people can have real things too. 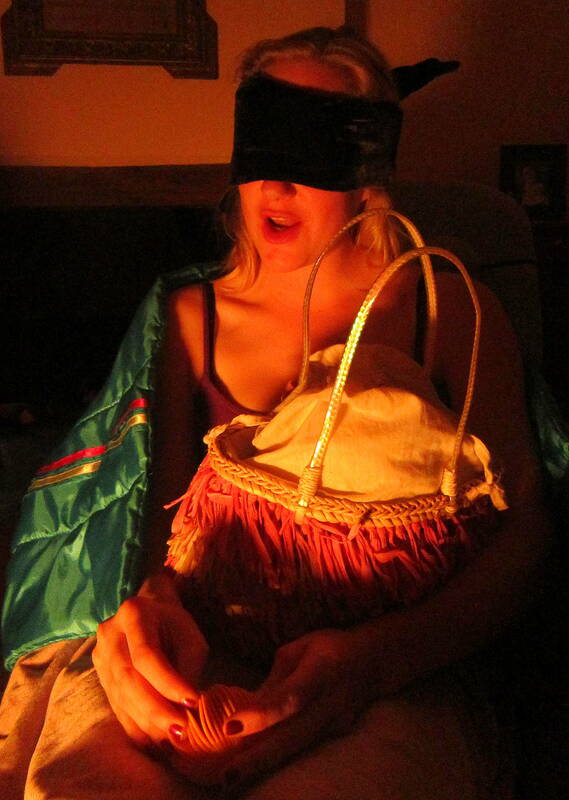 The Feely Box is a Sensory Box aimed at developing and refining the sense of touch. It was designed in collaboration with rather a lot of babies and toddlers, whom it is primarily for. It is not a toy box. 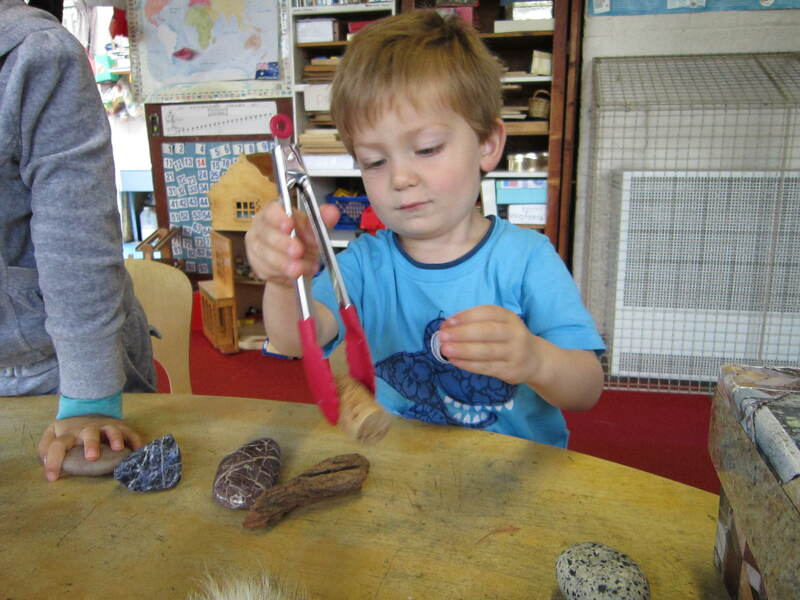 It is a learning tool which happens to be fun. If their experience so far leads them to expect all their toys to be brightly coloured plastic, hopefully this will cause intrigue and interest. The children I have shared it with certainly think so. I am opposed to ALL baby playthings being made of soft hygeinic plastic, nylon or cotton. These materials may comply with EU regulations and be totally risk-free, but they are also bland, smooth and boring. They do not have the texture to really stimulate and awaken the sense of touch, no matter how many crinkly scrunched up bits of plastic are inside that squishy corduroy snake. Most baby toys are not REAL, they are dumbed-down imitations of real things. 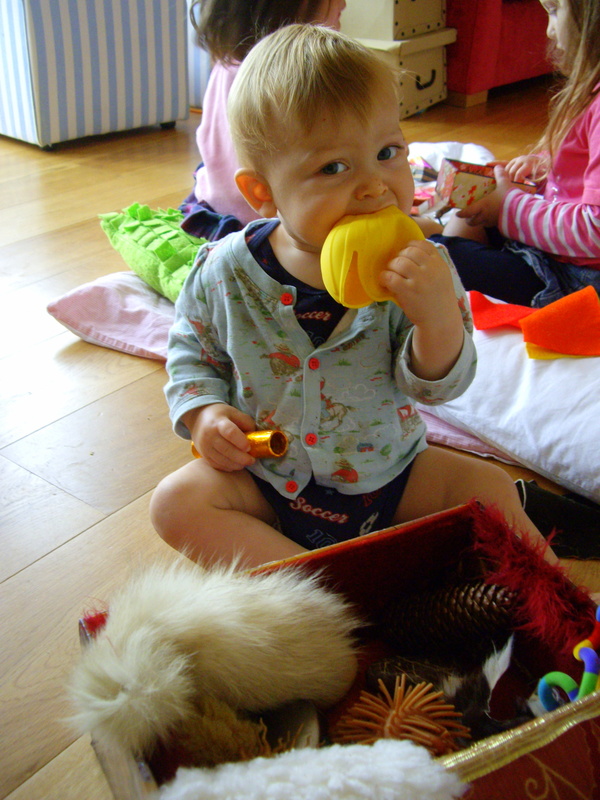 Babies and toddlers love to explore REAL objects, because they want to be like us grown-ups and inhabit the real world. Don’t worry, it’s not plugged in! 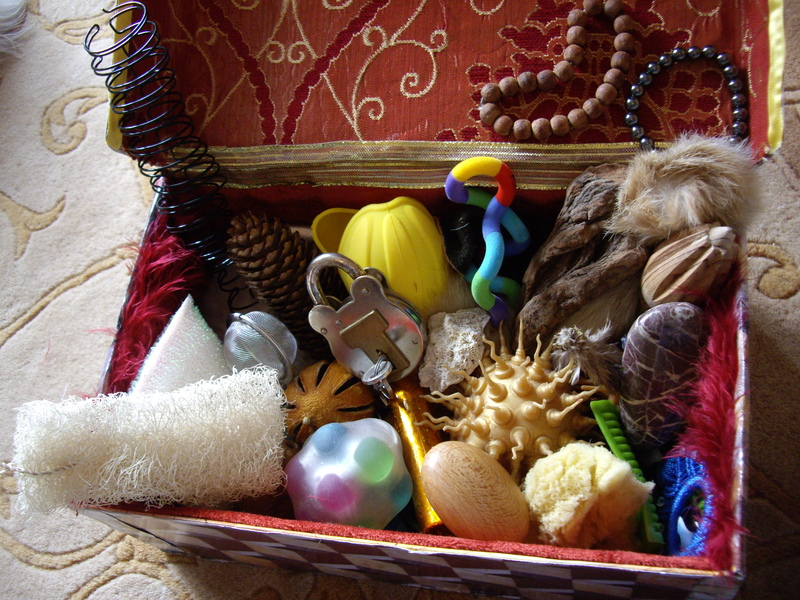 The Feely Box is crammed full of a wide variety of eclectic objects. I have tried to source items made from as many different materials as possible, so we have stone, wood, animal fur, various fabrics, cork, leather, natural sea sponge, silk, sheep’s wool, metal, rubber, glass, sisal, palm leaf and loofah, among others. I collect cones, stones, coral and dried oranges, locks with keys, hair curlers, gemstone bracelets and all manner of weird and wonderful things. Although I cannot guarantee 100% freedom from germs, everything is clean and reasonably safe to go into a baby’s mouth because that is where I know it will end up. The lips and tongue are important organs of touch, after all. I give it all a good wash after a session, particularly if it gets snot on it. 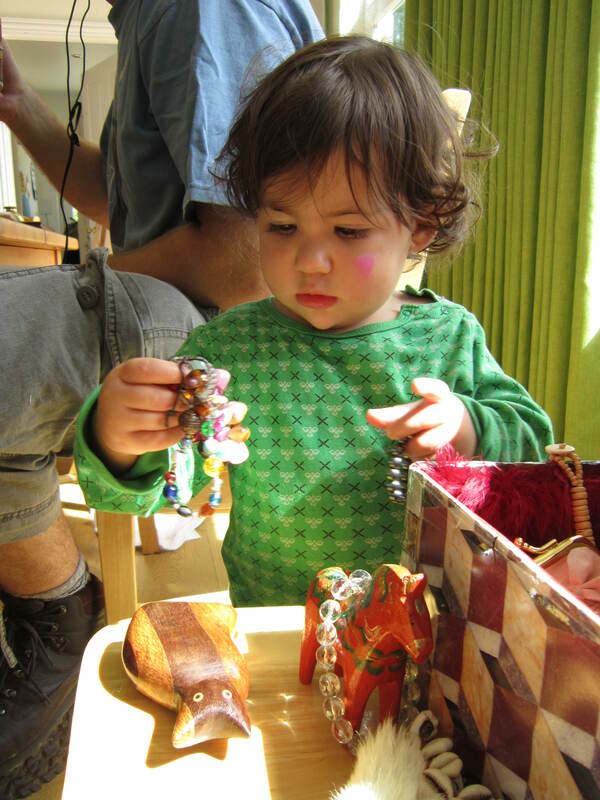 The only items that could possibly present a risk are the collection of little bracelets and necklaces, which, if a baby pulled or bit them hard enough, could break the string and cause little beads to go everywhere. But I just keep an eye on everyone. It is intriguing to discover items with different temperatures as well as textures….warm cork and fur, or cold metal and stone. 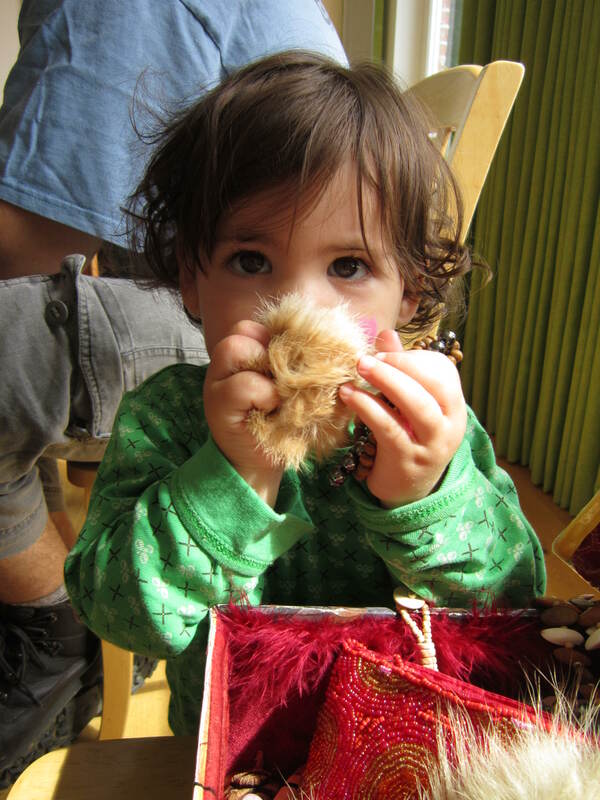 This little cutie adored all the pieces of fur, which she thought were very comforting! It reminded me of my own beloved childhood comfort blanky – a fox fur. 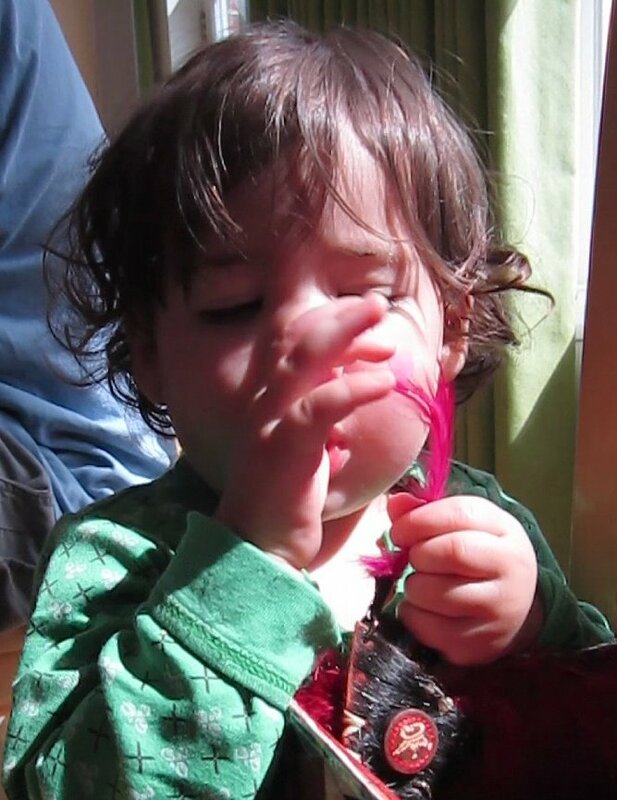 She also very much liked a little pink feather attached to a deerskin keyring. Some babies spend ages inserting small hair curlers through large ones, over and over again. 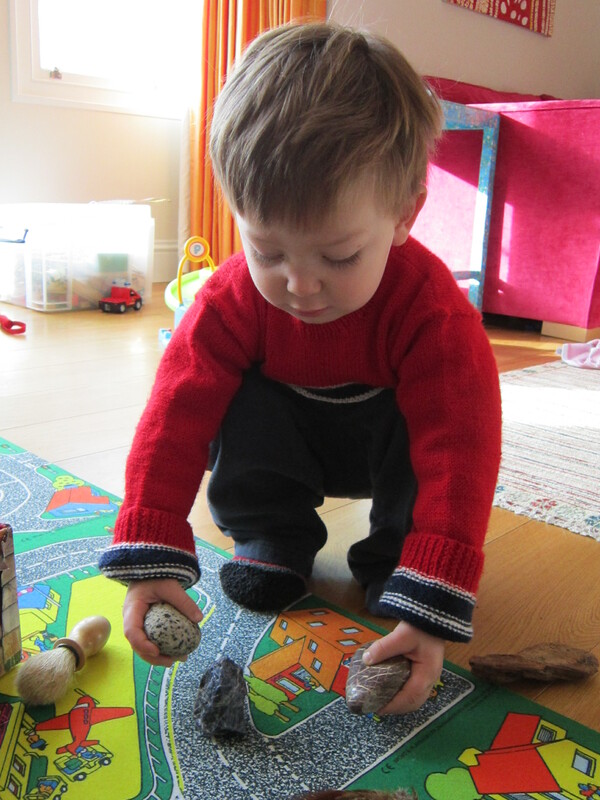 Other children want to weigh different stones and wooden eggs in their hands to feel the difference between heavy and light. 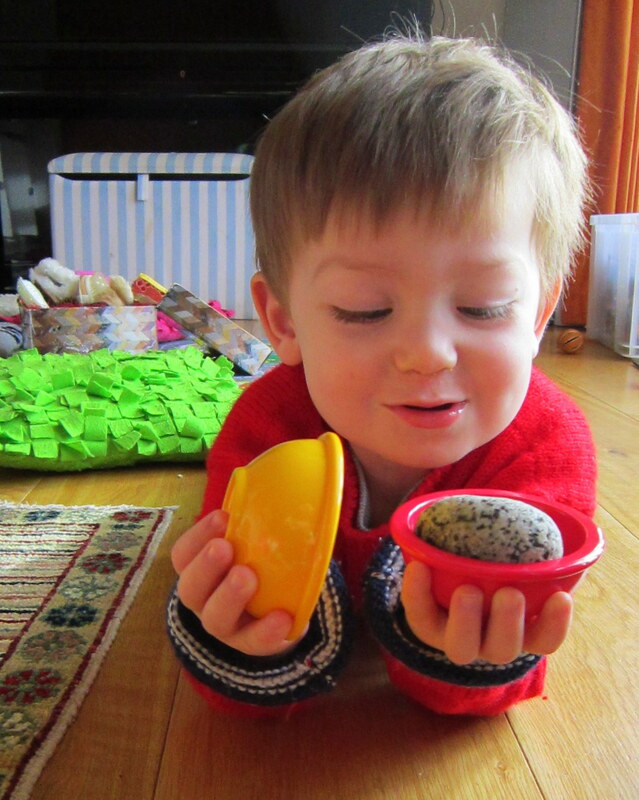 Or hide and discover them with little bowls from the Toolkit. I have learned from them to allow enough time to explore each item, and not to rush to give them something new in my own excitement. 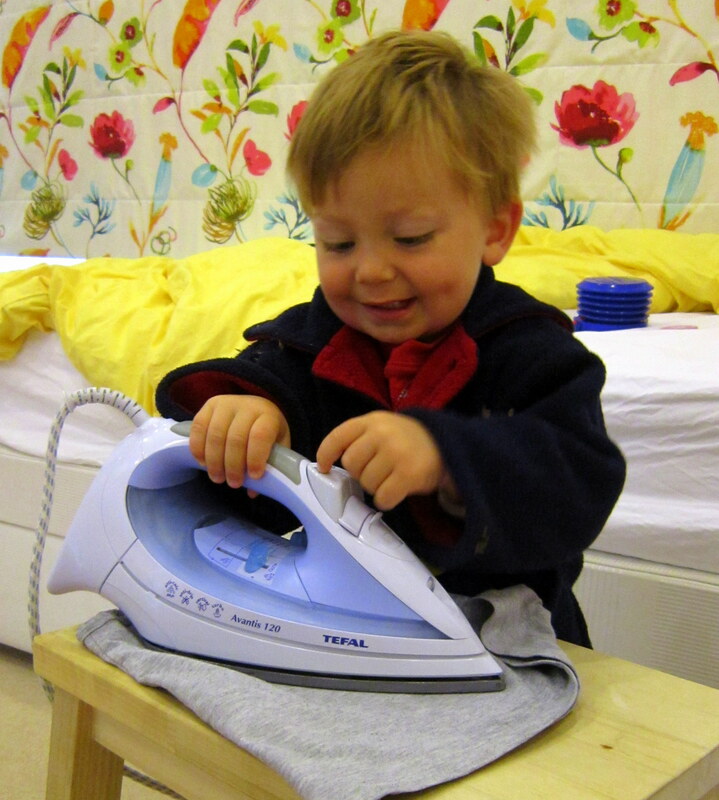 This lengthens their attention span, which is no end of help by the time they start school. 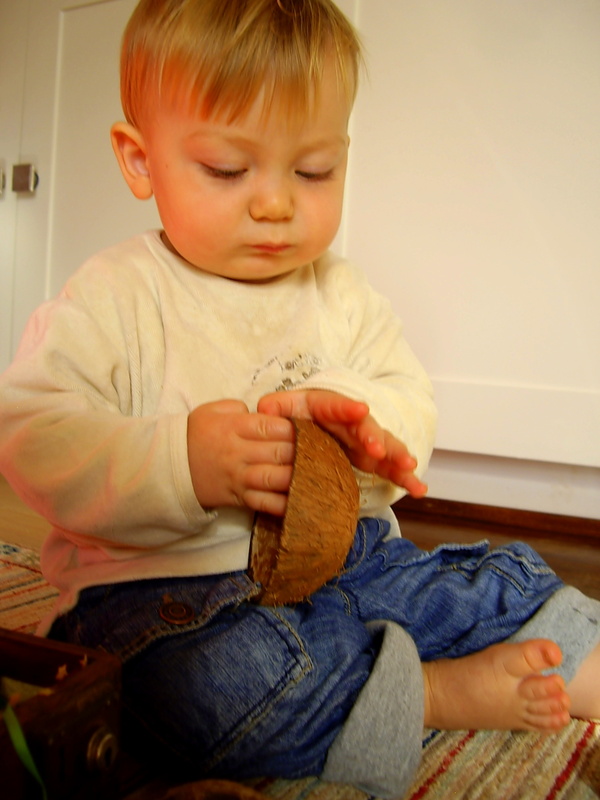 Feeling the rough hairy texture of a coconut shell and discovering lots of different bracelets and some wooden animals…. 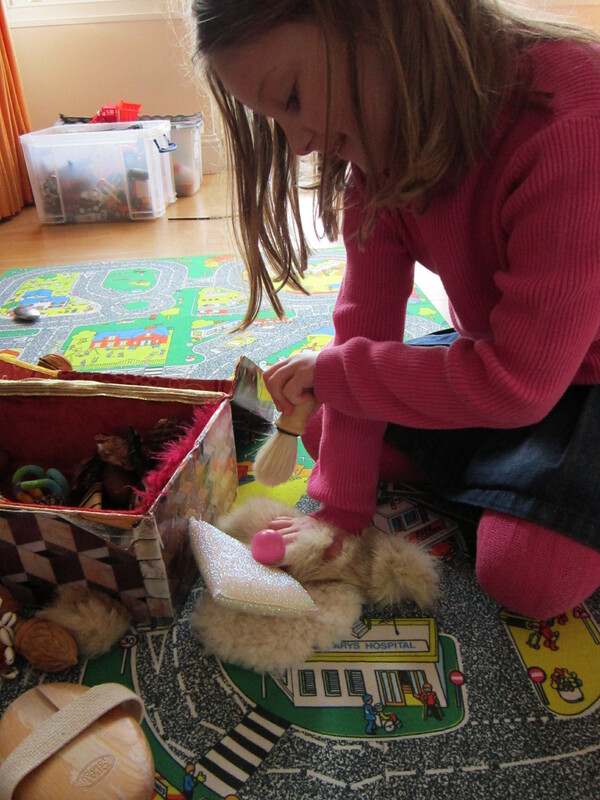 It is also interesting to notice that the box seems to grow with the child! 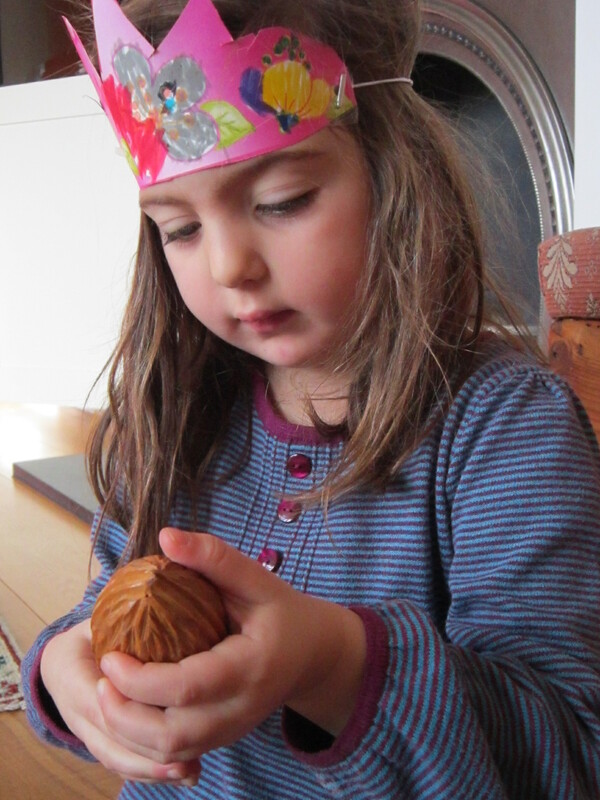 Older children like to fit items into the wooden nutcracker and find how it works, or try to unlock the padlock with the key. 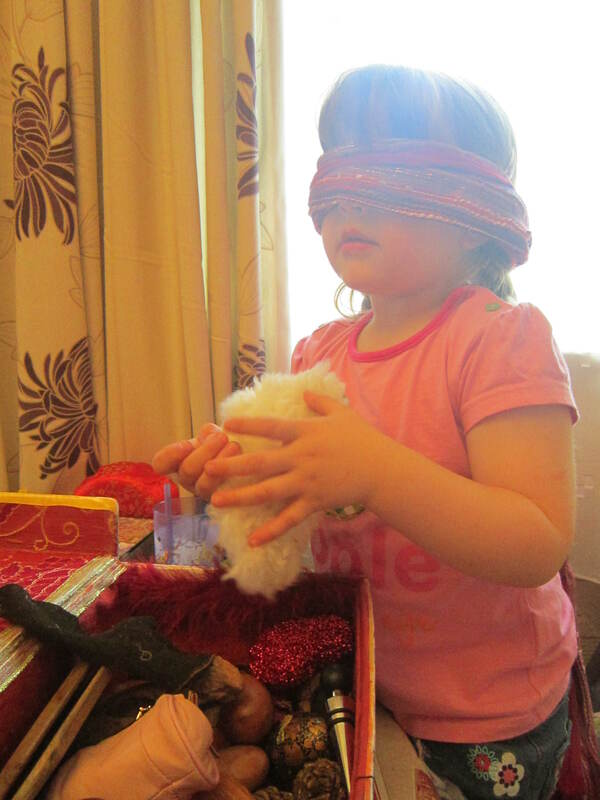 Or they play Blindfold Feely and try to guess what their blindly chosen items are by touch. 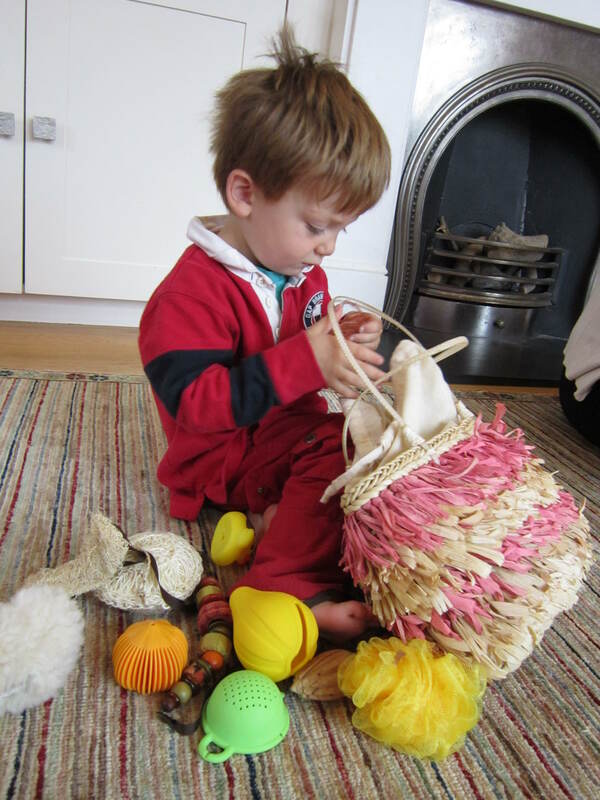 Or create characters out of the cones, sheep’s wool and feathers. 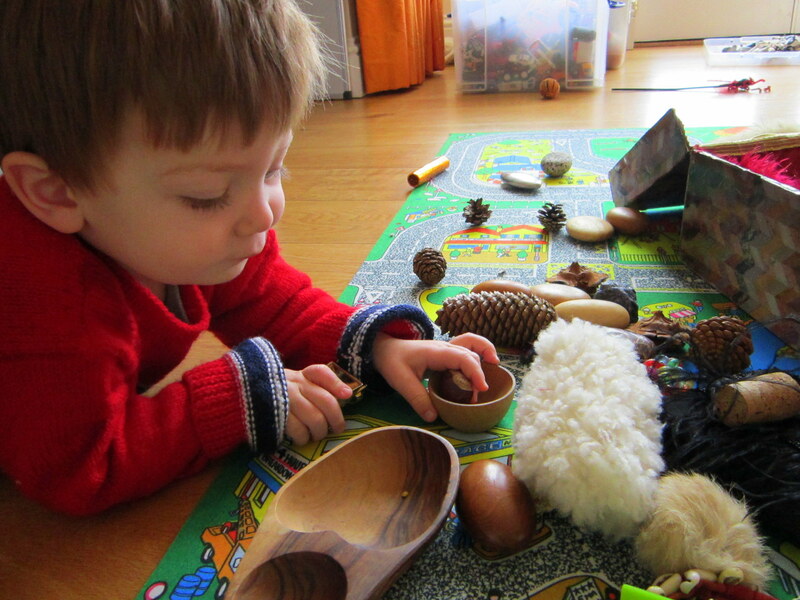 Or play a Montessori transferring game where they challenge themselves to fill a small basket with different items picked up with a small pair of kitchen tongs. 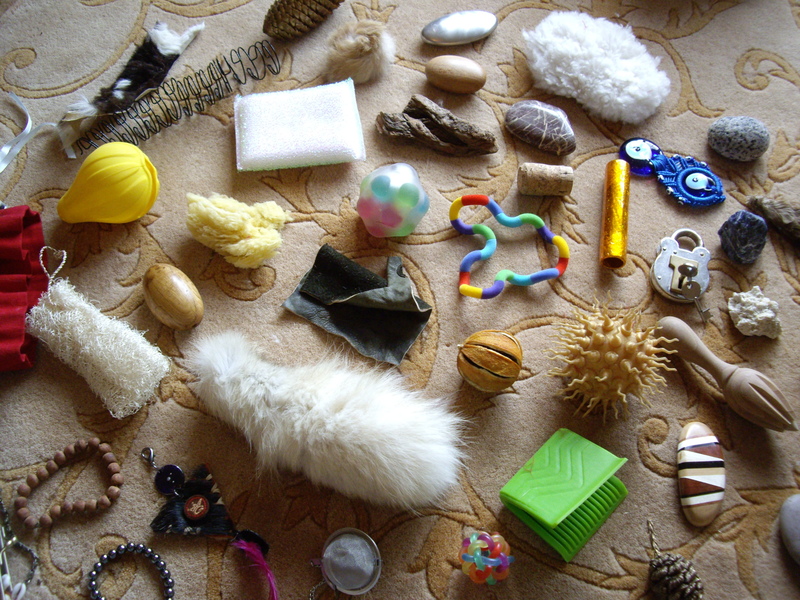 Most of it gets thrown all round the room and some bits inevitably get lost. But I am always looking for new items to add! 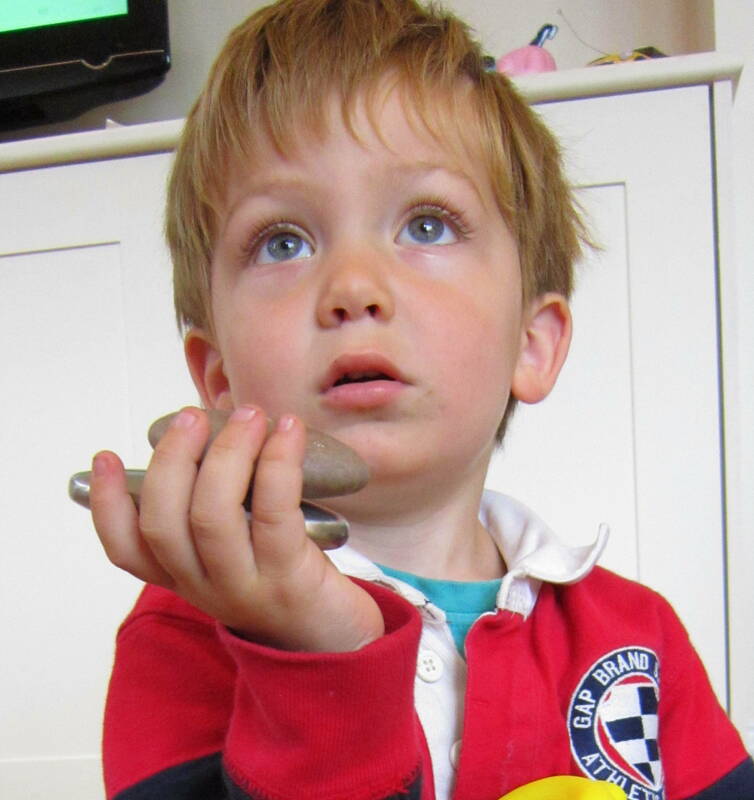 It is exciting, entering a charity shop or antique fair and looking at everything through a small child’s eyes. Possibilities leap out at me everywhere! I have had to find a hugely kitsch but immensely textural Overflow Feely Bag to house all the extra items I keep finding. It seems to appeal to younger and older children alike. 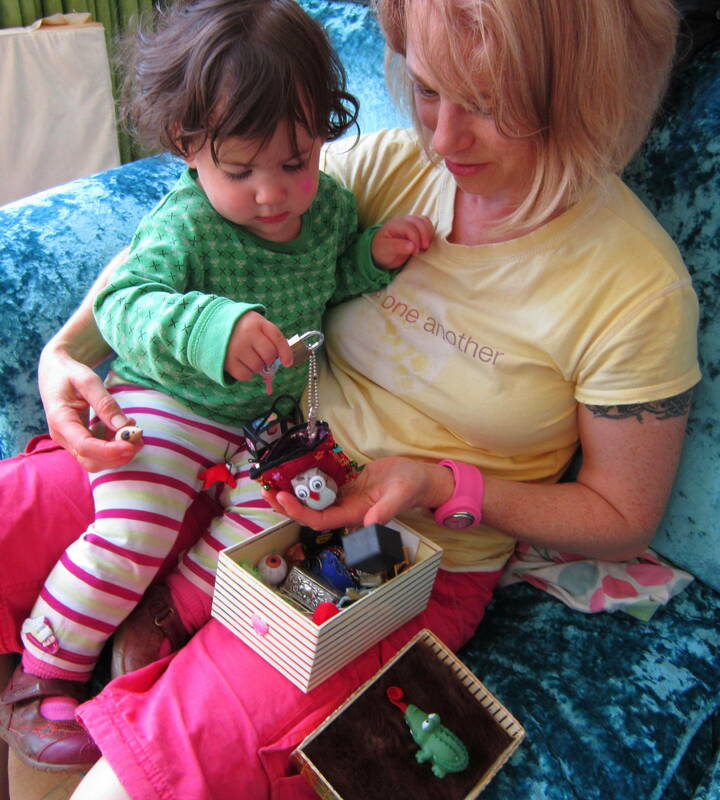 If you’d like to make your own Feely Box, I would highly recommend it as one of the most popular boxes and great for rainy days and school holiday amusement. If you’re stuck for ideas or unsure where to start, just post me a message in the comment box below and I’d be more than happy to help.